Starting from the conveniently available ex-chiral pool building block (R,R)-hexa-1,5-diene-3,4-diol, the ten-membered ring lactones stagonolide E and curvulide A were synthesized using a bidirectional olefin-metathesis functionalization of the terminal double bonds. Key steps are (i) a site-selective cross metathesis, (ii) a highly diastereoselective extended tethered RCM to furnish a (Z,E)-configured dienyl carboxylic acid and (iii) a Ru-lipase-catalyzed dynamic kinetic resolution to establish the desired configuration at C9. Ring closure was accomplished by macrolactonization. 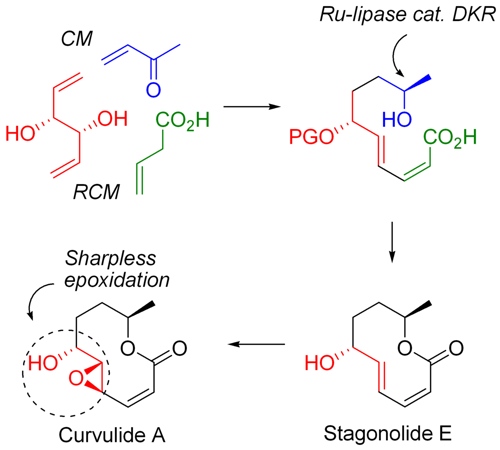 Curvulide A was synthesized from stagonolide E through Sharpless epoxidation.